Hearing Components, Inc. is a leading-edge provider of sound and in-ear technology. Through its Comply™ Foam brand, the business develops high-quality foam earbud tips that maximize comfort, sound isolation and in-ear retention. Comply’s leadership came to Snap with one overarching goal: to increase B2C sales by leveraging its social media platforms. With clear objectives in mind, our social media experts laid the groundwork for a cost-effective social strategy that would meet and exceed Comply’s business goals. By collaborating with The Comply™ team, Snap identified a range of tactics to increase product sales. For example, by boosting the presence of Comply’s social channels, we could give the target audience a reason to learn about and engage with the brand—eventually converting these users into loyal customers. To achieve this aim, Snap’s Social Media Team utilized online giveaways to draw the attention of potential customers. Through this approach and other organic reach opportunities, Snap increased social metrics across the board for the Comply™ Foam brand. 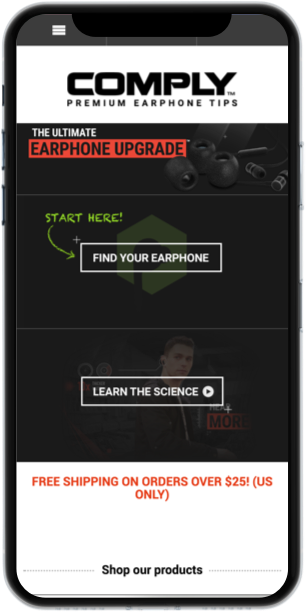 Thanks to its amplified social channels, Comply™ Foam is reaching audio lovers around the country, providing awe-inspiring listening experiences for musicians, commuters, athletes and audiophiles alike.